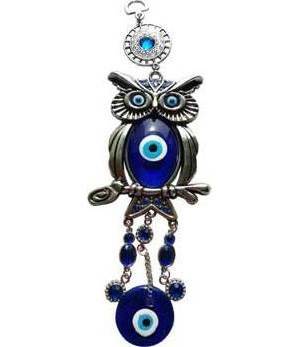 Combining the intense power of the perched owl totem with traditional nazar blown glass beads, this multiple eyed talisman may aid the space in which it inhabits with protection from all manner of misfortune and negative energy. This potent charm may be hung on the wall, above an entryway, in a window, on a door, or from whatever one may choose to help increase protection from harm through strength, wisdom. and foresight. Crafted with pewter and faceted blue crystals this item is approximately 10 inches in total length.